The final version of Firefox 3 will be released next Tuesday, June 17th Mozilla announced yesterday. Firefox 3 is under development from past 34 months, and they are releasing beta and release candidates in the past few months. Just before this announcement they released Firefox 3 RC3 for Mac users after fixing a bug that is effecting Mac users. 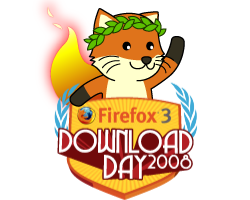 Get ready for the Firefox 3 release and make sure you download on the same day to help mozilla set the world record.